I decided not to go ahead with the calendar; there would have been an enormous amount of pressure to have done so. I informed my customers, scattered all around the world, of my decision and was amazed to receive many letters and e-mails saying how disappointed they were to hear the news. They understood the reasons, of course, but it was nice for me to know that my calendars had been looked forward to with so much delight and that they had made a difference in people’s lives. I have kept the letters and they are a lovely reminder of how people appreciated the work that I had done over a dozen years. The last Bear-a-thought illustration that I produced was to be for my thirteenth calendar and was planned to feature bears on a theme of the 12-months of the zodiac. I chose Pisces, (the birth sign for those born, on average, between February 19 and March 20) as my first piece of artwork, as I had a pet goldfish, called Monica, that I adored. She had been a companion for many years and was the most affectionate goldfish that I had known (I have known a lot). When the other fish in the tank were ill she would take food from the top of the water and take it down for them and encourage them to eat. She was a very intelligent fish and was like a nurse with fins :0) I would dangle my fingers in the water and she would come and swim around them and receive a delicate stroke. Some of her scales shone with the most beautiful gold – yes gold, not orange – sheen. All good things must come to pass, and my friend with fins died in August 2007. The illustration was created after Monica’s passing, as I wanted to include her in one of my illustrations. 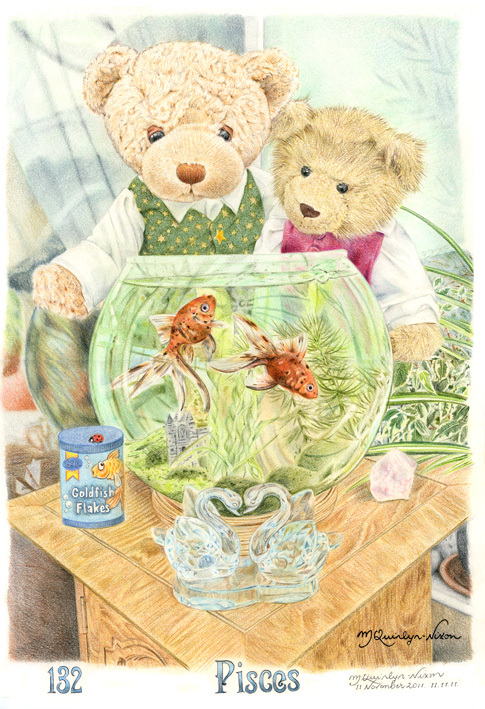 I also included two of my most popular teddy bears, Augustus and Scruff. I love Augustus’s sleepy eyes and the disheveled look that Scruff had about him. I still have these two bears, as I became very attached to them (and they to me, of course) and they reside in a big Victorian perambulator that my grandmother left me (she said it is an antique, but that has yet to be proved). They look quite keen to pose for me again, if the need ever arises. PS. I love double numbers, so it was rather fitting to finish the illustration on 11 November 2011 (11.11.11).